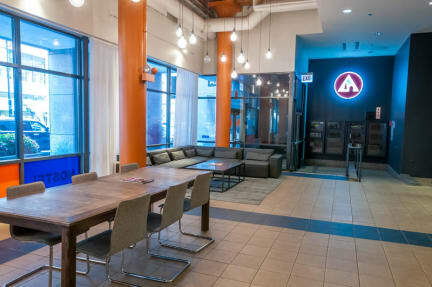 Experience the excitement of Chicago at this beautiful historic hostel, offering comfortable and contemporary accommodations in the heart of downtowns thriving university district. A place where you can learn and play, meeting other travelers from all over the world while breaking down the walls of international communication while playing the universal equalizer: ping pong. When you're done you can share your experience with your friends and family back home on Skype with our free Wi-Fi. Share a meal, share a day, share an adventure, share a smile at the greatest Chicago hostel! 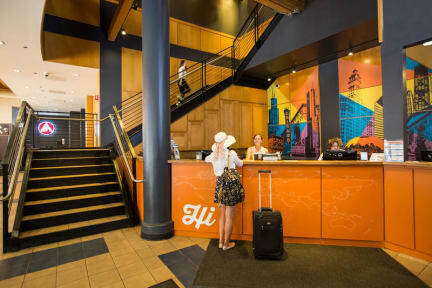 Hostelling International (HI) Chicago is one of America's best hostels offering safe, clean, quality accommodations. Spacious gender-separated dorm rooms with either 4, 8 or 10 beds, many with ensuite bathrooms. All dormitory rooms have individual lockers for personal belongings. The hostel also offers private rooms with ensuite bathrooms that share a kitchenette and lounge/seating areas. The hostel is located within walking distance of the Willis (Sears) Tower, Michigan Avenue/Magnificent Mile shopping, Lake Michigan, Millennium Park, Buckingham Fountain, Art Institute, Field Museum, Shedd Aquarium and Adler Planetarium. All other attractions are just a short bus or train ride away. HI-Chicago is within 2 blocks of all the major train and bus lines to help get you anywhere easily within the city and to/from the airports. -FREE daily activities to explore the city with fellow travelers including pub crawls, walking tours, outings to blues and jazz clubs, festivals, and much more! Great hostel, caters to a wider age range, but there were still social opportunities for a solo traveller. Felt safe in the area, and was convenient to all the major attractions. Dorm had shower, toilet and sinks all in separate areas, super handy. Would definitely stay again. This hostel is great! It's always clean and I love how they go the extra mile to be eco-friendly. A huge perk is the extra restrooms in the hallways. The dorm rooms are spacious and the entire hostel is very secure. Hostel is in good location. Rooms are very clean and beds are comfortable. Didn’t feel the hostel had much of an atmosphere. Amazing location and really nice staff. Everything was clean and the facilities were all good. Free breakfast was good and they have activities for guests. They even printed my boarding pass for me when I left. The only thing I’d say was the check in time is quite late and doesn’t seem to be flexible at all - considering at this time of year lots of beds remain empty, it seems weird to make us wait till 4pm to check in. Other than that, a really good experience. The hostel was pretty nice and in a good location. The staff was friendly and it was trying to be environmentally friendly which was nice. The bed I was in was kind of falling apart as were some of the others. It was fairly clean, but seemed like it was a bit older. Overall, pretty good. They charged me an additional $3 at check in because I wasn’t a member of their hostel. There should be a zero tolerance policy for misleading pricing on hostel world. Other than that, atmosphere was quiet, finishes were stale, and the staff was average. I’d try another hostel next time I’m in town.